The global mass spectrometer market features a largely consolidated vendor landscape, with the top three companies, namely Shimadzu Corporation, Thermo Fisher Scientific, Inc., and Agilent Technologies accounting for a significant 49% of the overall market in 2015, observes Transparency Market Research in a recent report. The vendor landscape is intensely competitive and has few players, most of them holding large share in the overall market. These factors have restricted the entry of new players in the market to a large extent and the situation is projected to remain the same in the near future as well. Transparency Market Research states that the market will exhibit a promising 8.1% CAGR over the period between 2016 and 2024, rising from a valuation of US$5.35 bn at the end of 2016 to US$9.99 bn by 2024. Of the key product varieties, including gas chromatography-mass spectrometer (GC-MS), liquid chromatography-mass spectrometer (LC-MS), matrix associated laser desorption/ionization-time of flight (MALDI-TOF), and inductively coupled plasma-mass spectrometer (ICP-MS), the segment of MALDI-TOF presently dominates. The segment accounted for a massive 30% of the overall market in 2015 and is expected to retain dominance in the next few years as well. The higher preference to MALDI-TOF spectrometers over other varieties can be attributed to the faster rate of analysis and simple nature of sample preparation achieved with them. From a geographical perspective, the market for mass spectrometers in North America is expected to account for a dominant share in the global market, chiefly owing to the thriving biotechnology industry. The Europe market closely follows, acquiring a significant share of the global market owing to the established pharmaceutical industry and a flourishing biotechnology industry. In the near future, the Asia Pacific market is expected to emerge as a promising market for mass spectrometers owing to the rising demand for high quality analysis tools. The development of advanced mass spectrometry devices such as matrix-associated laser desorption ionization imaging mass spectrometry (MALDI-IMS) and high-resolution accurate mass system is one of the key factors expanding the scope of growth opportunities in the global mass spectrometer market. MALDI-IMS systems allow the more accurate and quicker examination of tissues for diagnostic purposes, reducing the overall time required for the overall analysis of diagnostic samples. High-resolution accurate mass system are capable of detecting as well as delivering an accurate and high resolution full product ion spectrum of samples. 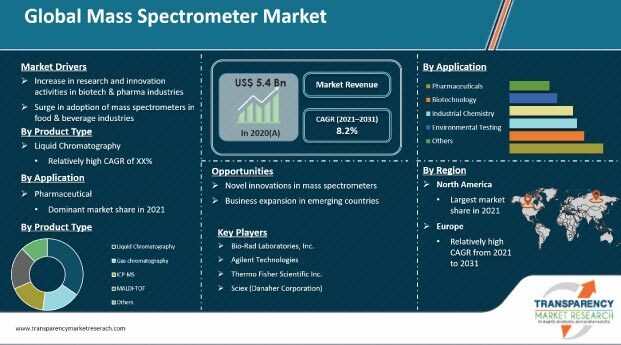 The market is also driven due to the rising adoption of advanced mass spectrometers across a large array of applications in industries such as life sciences, pharmaceuticals, and a number of other clinical analytical activities. From a competitive perspective, the rise in the number of mergers, acquisitions, and collaborations in the market in the past few years has also benefitted the market by allowing a significant rise in the rate of development of innovative and advanced technologies. The vast funds required to undertake research and development activities in the field of mass spectrometry are limiting development efforts in the market to a certain extent. The high costs have not only restricted the entry of new and small companies in the market but have also deterred leading players from undertaking large-scale research and development activities. High product costs also limit the growth of the market to mostly developed economies; price-conscious consumers in regions with significant growth opportunities, such as Asia Pacific, prefer to buy refurbished mass spectrometry equipment.